We Are 20 Miles From The Taos Ski Valley And 1.25 Miles From The Center Of Town. Property 1: We Are 20 Miles From The Taos Ski Valley And 1.25 Miles From The Center Of Town. Cozy Casa Carmelita features a Brilliant Kiva Fireplace, Unique Patio & Hot Tub! Property 3: Cozy Casa Carmelita features a Brilliant Kiva Fireplace, Unique Patio & Hot Tub! Springtime in Taos... Enjoy downtown festivities!!!! Property 4: Springtime in Taos... Enjoy downtown festivities!!!! Charming Adobe Cottage in Idyllic Setting. Artist's Getaway. Property 16: Charming Adobe Cottage in Idyllic Setting. Artist's Getaway. Come Ride The Chile Line In Our Cozy 1898 Narrow-Gauge Boxcar. Property 17: Come Ride The Chile Line In Our Cozy 1898 Narrow-Gauge Boxcar. Beautiful mountain chalet within 5 minutes of all Angel Fire amenities. Property 18: Beautiful mountain chalet within 5 minutes of all Angel Fire amenities. Enjoy a Get-A-Way @ this cozy log cabin on Eagle Nest Lake, in Eagle Nest NM!! 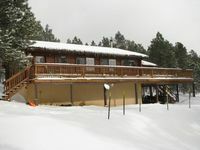 Property 19: Enjoy a Get-A-Way @ this cozy log cabin on Eagle Nest Lake, in Eagle Nest NM!! Enjoy the Mountain Cabin ! Property 27: Enjoy the Mountain Cabin ! "Camp Griffin on The River" 1 Acre lot w/ pool table! Property 28: "Camp Griffin on The River" 1 Acre lot w/ pool table! Comfortable Family Cabin in Perfect Location. Property 29: Comfortable Family Cabin in Perfect Location. Up to 4 guests sleep in this cabin located 6.5 miles from Taos, close to skiing. Property 37: Up to 4 guests sleep in this cabin located 6.5 miles from Taos, close to skiing. Welcoming, Comfortable Angel Fire Home with Two Master Bedrooms! Property 39: Welcoming, Comfortable Angel Fire Home with Two Master Bedrooms! Chalet cabin, 4 bedrooms, near golf course , 5 minutes to ski area. Property 44: Chalet cabin, 4 bedrooms, near golf course , 5 minutes to ski area. NEW! 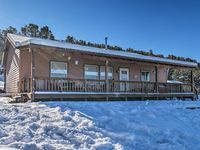 Cozy Ski Cabin w/ Deck Near Taos Ski Valley! Property 48: NEW! Cozy Ski Cabin w/ Deck Near Taos Ski Valley! The cabin was very nice and well appointed. We would stay there again. We really enjoyed our stay. The place was very roomy and cozy for 8 people. They have everything you can think of, the WiFi was very good, and a huge movie selection.During our stay, I texted Ian a question and he responded very quickly! When we got there it had been snowing, would recommend if you have a 4 wheel or all wheel drive vehicle to make it up the drive way. His neighbor, Jack is super friendly and helped one of our vehicles that couldn&rsquo;t make it up to the cabin. The cabin was about 5 miles from the resort. We would definitely be coming back!